NVS Admit card 2016 is released by Navodaya Vidyalaya Samity on its official website nvshq.org. All the latest updates regarding Navodaya Vidyalaya admit card will be available here. NVS 9th Class Entry test admit card are issued by NVS website. 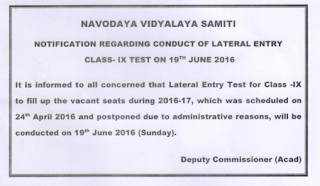 Navodaya Vidyalaya Samiti is going to organize 9th class entry test on 19 June 2016. Earliar this entrance test is to be conducted on 24 April but later postponed to be held on 19.06.2016. Through this Lateral entry test, admission to JNVs will be done. The NVS 9th Admit card are going to be available from June 2016. We are going to update you on this. This admit card / admission ticket is mandatory for applicants to bring at the test centre as without it, no one will be given entry. The entrance exam of the candidates will be carried out in the district concerned. It is a 3 hours duration examination in English medium. NVS Admit card for appearing in 9th class selection test will also be sent by post. If a candidate is not able to get / download it, can contact their district Jawahar Navodaya Vidyalaya.